#HappiTness in Copenhagen as #HappiTeam wins the Best Office 365 Add-In at the 2018 European SharePoint, Office 365 & Azure Community Awards. These awards celebrate excellence, innovation and outstanding contributions. 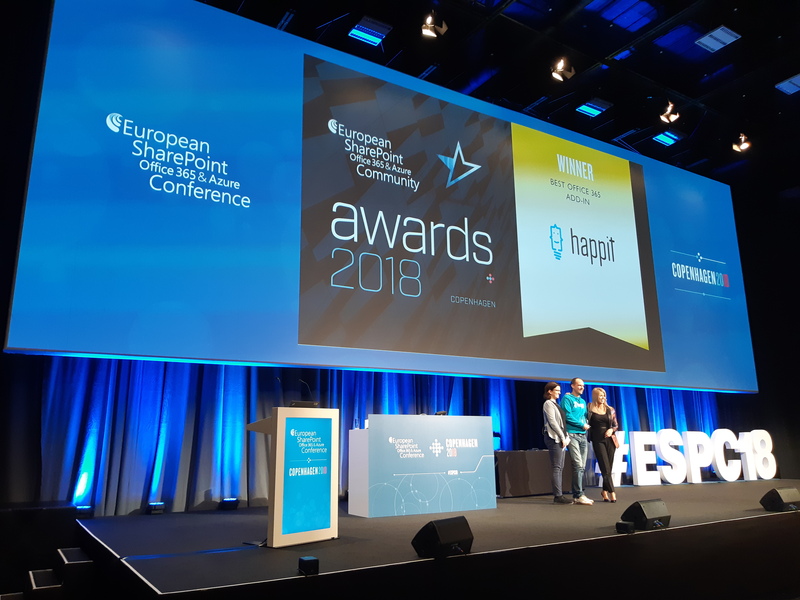 The awards are part of the biggest European event concentrating into Microsoft flagship services SharePoint, Office 365, and Azure – the ESPC – European SharePoint Conference. This year the ESPC was held in Copenhagen. Happit is a single-click learning solution created to ease the users adoption of cloud services like Microsoft SharePoint. Finland is a forerunner in cloud consumption and Happit is in the front-line in exporting the Finnish IT and education know-how. The ESPC Awards represent and recognize the best projects, people and teams in Europe and are an affirmation of the hard work, innovation, and dedication of those in the SharePoint, Office 365 and Azure community. Happit was honored to be a double finalist in the categories of most innovative SharePoint Solution and Best Office 365 Add-In. ESPC selected the finalists of the awards based on four critical criteria; solved a business problem, solution, development process, and impact. European SharePoint, Office365 & Azure Community Awards were presented in six categories, with winners chosen from a set of entrants from countries worldwide. Enhancing cloud consumption has become an essential part of the Microsoft partner strategy. Based on our customer study on media industry 98% of users prefer Happit over traditional training when it comes to learning how to use cloud-based software. Digital broadcasting company MTV trained their sales division to use Dynamics CRM and to align work methods through the company. “We are delighted to see companies like Happit get recognition in the community. It is a perfect example of a modern ISVs taking full advantage of Microsoft Azure platform and transforming its features to a value-adding service for the end customer. In addition, it is taking on to one of the biggest challenges of cloud service era – Customer Success Management”, rejoices Chris Dial, Senior Director of Cloud ISVs and Startups at Microsoft. “We are humbled to see all the attention we get only after 7 months of releasing the service. It has been a huge effort from the team as well as all our partners. As Happit is designed for the ecosystem, we want to give back to the community. Therefore, we decided to release a free #JustHappit version of the service for employee teams. This lowers the barrier for people to see the value of in context learning in action in their area of responsibilities”, celebrates #HappitFamily Officer JP Wirta. Happit was founded early 2018 to bring learning one click away for the employees. Technology itself cannot enable ongoing digital transformation, but the user training and support for new technology and ways of working are the key elements. As Microsoft updated its strategy for the current fiscal to promote more user adoption and technology consumption over license sales, Happit saw a great opportunity to help Microsoft’s extensive partner network change their skill set towards this critical challenge. Only for Microsoft ecosystem, it is expected to be a business of 5.2 billion dollars over the next three years. At the beginning of the year, Happit raised a 1 M€ funding from Business Finland to accelerate internationalization. Under six months Happit has been able to establish a steadily growing partner network in Microsoft ecosystem in 13 countries and three continents. Happit employs 12 professionals and the key personnel has over 15 years of experience in developing digital business solutions and consulting digital transformation. Happit’s headquarters are located in the heart of Helsinki and Happit has branches in Switzerland and Mexico. Happit has plans to expand to London in collaboration with a new partnership.